After catching a decent chub on the plug last time I was out I was reminded of my efforts to catch these fish on natural minnows in the past. The tackle is simple with a small circle hook on the end of the line which is used to lip-hook the minnow. The bait is then flicked into any 'chubby looking' spot. It is usually easy to feel the plucks of a taking fish and then it's simply a matter of gently tightening the line until the fish is hooked. 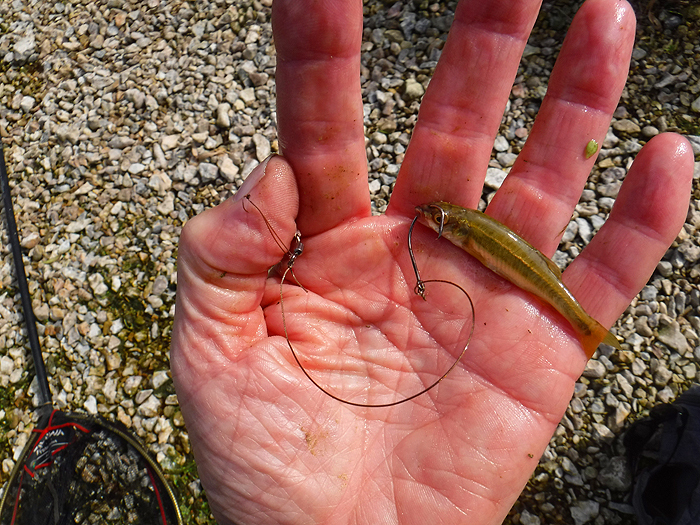 Because I use circle hooks the chub (or perch, trout or pike) are generally lip hooked so it is easy to release them. As a rule I get more bites than when I'm spinning, probably because it is easier to get a bait to the fish without scaring them. I expect that a slug or lobworm would work just as well as a minnow but minnows are usually readily available where I tend to fish. Of course there are one or two snags to this type of fishing. 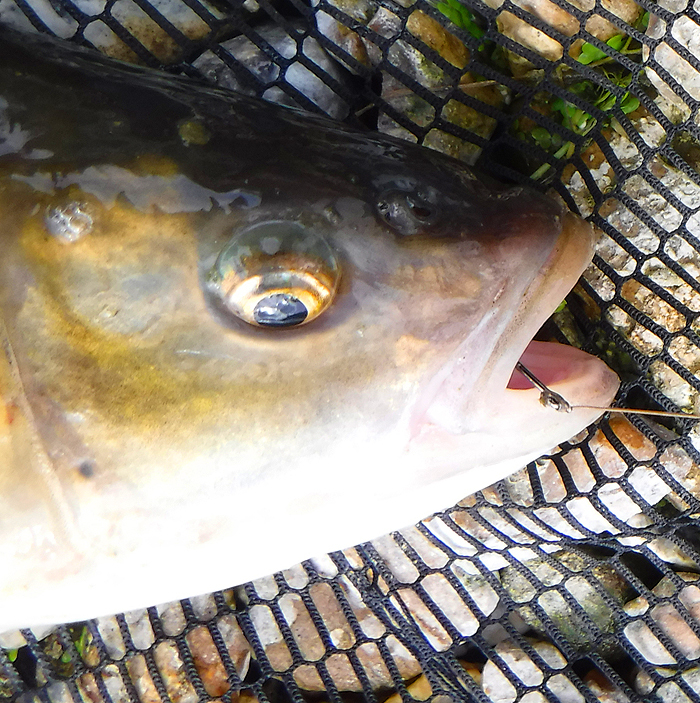 Jack pike can be a problem as their razor sharp dentures easily slice through the line so in my local rivers it is necessary to use a wire trace. Knottable wire such as AFW Micro Supreme which is easy to tie, pretty flexible and apparently not too visible to the fish seems fine and I've no evidence that it puts fish off. Suitable hooks for minnow fishing are about size 6 or 8 but on my recent trip I could only catch medium sized minnows and I didn't have any size 8's so I was forced to use the bigger ones which looked (to me) a bit too crude. I always prefer the biggest minnows I can get, partly because they are easier to cast a fair way. I suppose that the main problem is catching bait and although it is usually easy, on the odd occasion the minnows seem to be few and far between and this can be frustrating. 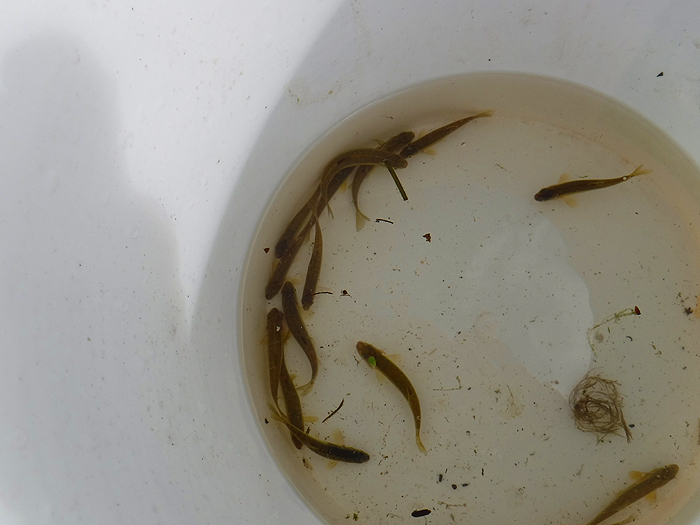 Minnows can be caught in nets or traps but these are not size selective so, if I want larger ones I tend to use a small hook and a maggot for bait. To avoid carting a second rod with me I generally tie a few inches of fine nylon to the circle hook, knot on a size sixteen and dabble it where I can see suitable baits. A small plastic tub or bucket suffices to keep the baits in good condition and it generally doesn't take long for me to catch a dozen or so. The minnow is hooked through the top lip and cast upstream and across. By reeling to keep pace with the flow of the river it is possible to stay more or less in contact with the bait. A bite will be signalled when you see or feel the line twitch and then, as I say, it is simply a matter of tightening up. 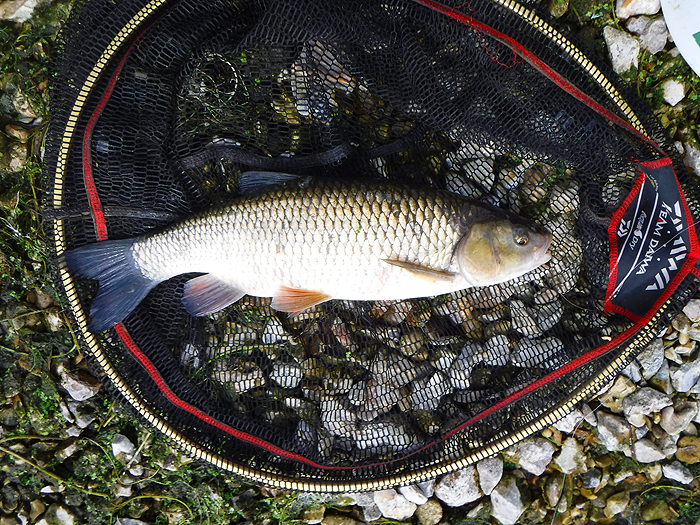 My latest trip only produced one modest chub so nothing to shout about but next time I shall try to obtain better baits and I have to say that I find this fishing as exciting as any that I do. Not the biggest minnows in the world but just about large enough. The minnow on a (too large) circle hook and wire trace. Not a bad fish and very satisfying.